This isn't just any ordinary chicken pot pie. 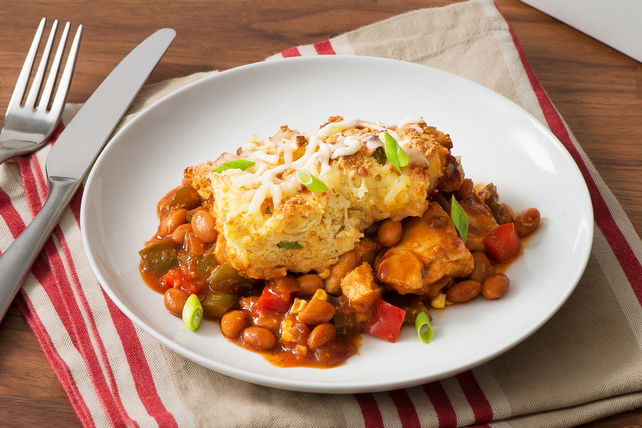 Our Cowboy BBQ Chicken Pot Pie is made with chicken, peppers, onions, corn, beans and barbecue sauce, which guarantees a tasty homemade chicken pot pie with a touch of heat. Heat 2 Tbsp. oil in large nonstick skillet on medium heat. Add chicken; cook 4 to 5 min. or until no longer pink, stirring frequently. Remove chicken from skillet; set aside. Heat remaining oil in same skillet. Add peppers, red onions and corn; cook 4 to 5 min. or until softened. Add beans, barbecue sauce and chicken; mix lightly. Spoon into 8-inch square baking dish sprayed with cooking spray. Reserve 1 Tbsp. green onions for later use. Whisk egg and milk in medium bowl until blended. Add baking mix, remaining green onions and 1 cup cheese; mix well. Spread over chicken mixture. Place baking dish on baking sheet. Bake 25 min. or until toothpick inserted in centre comes out clean. Top with remaining cheese; bake 5 min. or until melted. Sprinkle with reserved green onions. Refrigerate the leftover barbecue sauce (in bottle). Serve as a dip for hot cooked French fries. Or, use instead of pizza sauce when preparing your favourite homemade pizza. Put the electronic devices down to avoid mindless eating. Focus on the task of eating to avoid over consumption and poor food choices.